-Tremendous athlete. Impressive combination of quickness, body control and sheer strength in the open floor. Overpowers smaller guards on a regular basis. Gets to wherever he wants on the floor. Outlook Despite being considered the #1 point guard prospect in the class, Duval struggled for the most part in Portland, particularly in the scrimmages where he was outplayed by Collin Sexton. Duval's jump-shot hasn't made the type of progress you may have hoped, and defenses have gotten much smarter about sagging off him and forcing him to beat them from outside. He's a monster in the open floor, but his decision making skills are still catching up to his athleticism ability in the half-court. 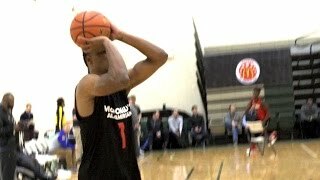 Practice highlights of elite 2017 high school prospect Trevon Duval from the 2017 McDonald's All-American Game in Chicago, Illinois. New Castle, Delaware native Trevon Duval, the #1 ranked Point Guard in the class of 2017 was one of the more highly touted prospects coming into the Elite 24 game. At first glance it's easy to tell what makes Duval such an intriguing prospect from the point guard position. At 6'3, 188 pounds, with a 6'8 wingspan Duval already has the body of an NBA point guard, and his frame still looks like it still has room to fill out. It would not be surprising to see Duval pack on another 10 pounds and get to 200, without sacrificing the speed and quickness that make him so impressive. Duval is an elite ball handler who can get into the paint out of isolation situations, and often freezes his defenders with advanced crossover dribbles and hesitation moves. He's got an extra gear he can get to in the open floor, and is a dynamic finisher in transition with the explosive ability to finish above the rim or in traffic with creative body control. Duval is an extremely aggressive player by nature, and is often in attack mode looking to get downhill and score in the paint. He has the vision and skill level to make different types of passes, but as he gets to the next levels he'll have to learn how to make reads and play out of the point guard position at a more efficient level, as he's a little too aggressive at times looking for his own offense. His jump shot remains a work in progress, but he has good mechanics and has shown that he can take and make tough shots, and that aspect of his game seems to be on an upward trajectory as he appears to be putting in the work to address it. His decision making can be somewhat careless as well, as he's a little more turnover prone than you might hope at times, looking to make too many homerun type plays. Duval went head to head with New York City Point Guard Isiah Washington at the Elite 24 game and looked very comfortable on the big stage. Whatever high level program lands Duval in 2017 will have a point guard that is ready to make an impact immediately. Trevon Duval, the top point guard in the class of 2017, had a team-high 25 points and took over down the stretch, as Team Drive emerged with a win thanks to his powerful finishes at the rim in overtime. Duval is known as a player who is capable of relentlessly attacking the rim off the bounce, and he lived up to that this week. At times he can be overly reliant on his dribble to get by the defense, which does get him into trouble on occasion, but more often than not as a result of his ball-handling, quickness and power he creates a finishing opportunity at the rim for himself or dishes to a teammate with his impressive court vision and passing acumen. At the Elite 24 practices in front of NBA scouts, Duval flashed potential as a shooter. Of note was a catch-and-shoot 3-pointer as he spotted up from the corner, caught the ball, came to a smooth stop and fired away in transition. He hit another spot-up mid-range jumper a few minutes later, again showing solid mechanics with his feet set. The potential is there, even though his career 26/111 shooting [23%] in 28 Under Armour Association (AAU) games show just how much room he has to grow in this area. The rising senior understands that making outside shots on a regular basis will help to open up the rest of his game. When peering through a shooters lens, his idols are point guards and some of the best shooters the league has ever seen. By no means was Duval the only lead guard at the Elite 24 who knows he has to become a more consistent perimeter threat. Duval proved to be one of the best point guard prospects in attendance both in terms of his play and his physical profile. From a purely physical standpoint, Duval looks the part of an NBA point guard at 6'2 with a very mature 190-plus pound frame, and at least a 6' 7 wingspan. He possesses a tremendous first step and an ability to shift gears with force as well as the vertical explosiveness to play above the rim in space. Maybe the most positive development for Duval revolves around the progression he appears to have made with his jump shot. While he still has a ways to go and the mechanics are a bit rigid, Duval has found some semblance of consistency as he's shooting the ball the same way every time both off the catch and on his mid-range pull up. Having shot only 2-of-27 from 3 (7.4%) and 50-for-94 from the free throw line (53.2%) according to our database, any signs of growth are a positive for Duval. His upper body is a bit locked and robotic but he's getting solid rotation and shooting a set shot every time. Duval appears to be adding more ways to get to his pull up game, using his quickness and strong footwork to create some space, it's just a matter of finding ways to use those developing skills in game play. As for the rest of his game, Duval is still at his best when he's getting a piece of the paint. He can get into the teeth of the defense without a ball screen (or split the pick and roll instinctually) thanks to his burst and elite ball skills, and has the tools to finish acrobatically around the rim, although he oftentimes unnecessarily heightens the degree of difficulty at the cup. He does a great job of spoon-feeding big men around the rim, oftentimes in highlight fashion with no-looks or creative drop offs, which can also result in flash over substance' turnovers as well. Duval is still improving his overall pick and roll play and knack for making his teammates better without getting into the teeth of the defense. While he's very good in penetration situations, he can sharpen his ability to read the game from the perimeter and make advanced passes  18.9 assist percentage and a 16.7 turnover percentage according to 30 games in our database. The New Castle, Delaware native is still searching for more ways to score in the half court  14.8 points per 40 minutes on 48.8% from two-point range  but continuing to improve his jumper should open things up for him. Not the most vocal guard on the floor, Duval did have a tendency to fade in and out of scrimmages, but that's partially due to the nature of the camp. On the defensive end Duval shows flashes of brilliance when the game got tight thanks to quick feet, strong frame, long arms and solid instincts. All in all Duval could still use some polish as a scorer, shooter and decision maker, but the groundwork is most certainly there for him to continuing to develop into a high-level lead guard prospect. -Very focused on his own scoring. Tends to freeze out teammates at times. Still learning how to balance the responsibilities of being a lead-guard in terms of getting others involved. -Not a consistent shooter at this point, particularly with feet set. Made just 23% of 3-point attempts at UAA on 53 attempts this summer. -Tends to fling ball at the basket at times. Has some very bad misses left or right. Outlook Aggressive combo guard with impressive scoring instincts. One of the more mature players in his class, likely done growing. Needs to continue to improve as a playmaker and outside shooter. Spectrum of opinions on him is extremely wide at the moment. A video interview with high school point guard prospect Trevon Duval at the Under Armour Elite 24. -Tremendous frame. Wide shoulders. 6' 2 with a 6' 8 wingspan. -Quick first step. Lives in the paint. Tough to stay in front of. Able to play at different speeds. Does a nice job protecting the ball on his drives to the rim. -Good athlete. Uses his size and length to finish effectively despite having average size. -Capable distributor. Best in drive and dish situations. Does a nice job getting a piece of the paint, drawing the backline defender and dropping it off to the big. Shows flashes of creativity as a passer. -Has the tools to be a very good on ball defender. Long arms, great frame, quick feet. -Just turned 17 on August 3. -More of a scoring combo guard at this stage. Would rather get buckets than distribute. Hunting assists  gives it up when it will result in an assist. -Doesn't always move the ball around the perimeter. Likes to isolate. Has a tendency to kill possessions at times. -Turnover prone. Gets in too deep in the paint from time to time. Throws jump passes. Tries to thread the needle. -Very limited outside shooter. Mechanics aren't terrible but seems to lack confidence. 14-of-56 from three (25%) this summer (UAA+Nations) and 70-of-111 (63%) from the free throw line. -Demeanor can be a bit lazy. Doesn't always bring it on the defensive end. Duval is an intriguing prospect given his frame, length, quickness, ball handling ability, flashes of playmaking, and age. It will be interesting to see how the 17-year-old looks in couple of years as the game begins to slow down for him. If Duval can turn himself into more of a point guard and find a way to start making shots from the perimeter, he has a chance to be one of the better guards to come out of the 2017 high school class. Despite measuring 6-1 without shoes, Trevon Duval has a very long 6-7 ½ wingspan, which gives him very nice potential defensively. He is somewhat stuck between guard positions at the moment, being more focused on scoring than creating, but has really nice potential to continue to improve his all-around game thanks to his strong feel for the game, nice shooting stroke, and ability to operate at different speeds.